Transparency Market Research has published a new report on the global fluoroscopy and mobile c-arms market. As per the report, the global fluoroscopy and mobile c-arms market is expected to expand at a 3.0% CAGR from 2013 to 2019. The report, titled ‘Fluoroscopy and Mobile C-arms Market - Global Industry Analysis, Size, Share, Growth, Trends and Forecast, 2013 - 2019’, states that the global fluoroscopy and mobile c-arms market is predicted to progress from US$1 bn in 2012 to US$2 bn by 2019. Fluoroscopy and mobile c-arms are commonly used in studying human body parts by providing images, similar to X-ray imaging. These devices play a major role in cardiac catheterization, orthopedic surgeries, placement of interventional catheters into arteries, lumbar puncture, biopsy, and interventional radiology procedures. Growing preference for interventional radiology procedures is expected to result in a faster growth of the global fluoroscopy and mobile c-arms market in the years to come. Interventional radiology is favored as it causes less damage to tissues, resulting in faster recovery and less pain. The growing number of diagnostic laboratories and hospitals in the developing economy is the major reason behind the growth of the global fluoroscopy and mobile c-arms market. As per the Central Bureau of Health intelligence, the number of government-recognized hospitals rose from 4,571 in 2000 to 11,993 in 2011 in India. The rising number of government hospitals is another reason behind the growth of the global fluoroscopy and mobile c-arms market. The global fluoroscopy and mobile c-arms market is segmented on the basis of product type and geography. 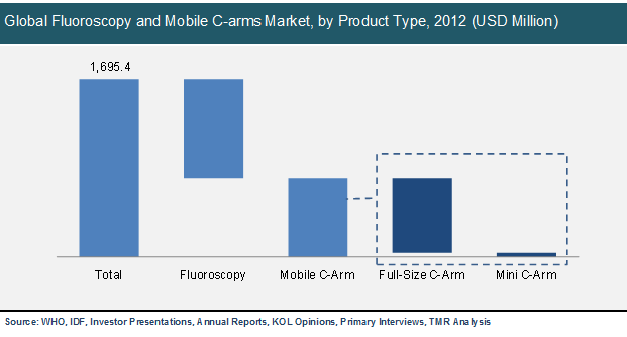 By product type, the global fluoroscopy and mobile c-arms market is classified into fluoroscopy and mobile c-arms. The mobile c-arms segment is sub-segmented into mini c-arms and full-size c-arms. In terms of revenue, in 2012, the fluoroscopy segment dominated the global fluoroscopy and mobile c-arms market. It is predicted that the full-size c-arms fluoroscopy segment will grow at a rapid pace in the years to come. Technical advancements and high number of applications are the two factors expected to drive the full-size c-arms segments during the forecast period. Demand for refurbished systems is expected to restrict the global fluoroscopy and mobile c-arms market, as they are less expensive. On the basis of geography, the global fluoroscopy and mobile c-arms market is divided into North America, Europe, Asia Pacific, and Rest of the World. In 2012, in terms of revenue and value, North America led the global fluoroscopy and mobile c-arms market due to factors such as acceptance of innovative products, high infrastructural investments, increasing awareness about new imaging devices, and financial capacity to purchase new machines. The Asia Pacific fluoroscopy and mobile c-arms market is predicted to develop rapidly in the years to come, due to factors such as the improving healthcare infrastructure, increasing awareness about innovative medical imaging procedures and discovery of untapped opportunities. The global fluoroscopy and mobile c-arms market is highly fragmented and competitive as new players are entering the market with their innovations. Some of the leading players in the global fluoroscopy and mobile c-arms market are GE Healthcare, Philips Healthcare, Toshiba Corporation, Hologic, Inc., OrthoScan, Inc., Hitachi, Ltd., Siemens Healthcare, and Ziehm Imaging GmbH.